‘Bible Basics – The Gospel of John’ The Gospel of John is the last written of the four gospels and contains many stories and sayings of Jesus that are not recorded in the other gospel accounts. The portrayal of Jesus in John’s gospel is also more spiritual than the others and is rich in images and metaphors. Funday Sunday Continuing our look at the life of Jesus we looked at Jesus as the “Fisher of men” with some fishing themes including brightly coloured fish and mini–rods, and the Good Samaritan. We also had a trip to Braehead to play adventure golf and laserquest. We took the opportunity to spend time in the arcade too. Some of us won lots of tickets to claim prizes at the end. The evening was thoroughly enjoyed by all and we hope to do it again soon. If you are or know a young person that may like to get involved with either Bible Class or Saturday Night Club please speak to Lesley, Ross or Nicola. All are welcome! Ross (in his capacity as MSP) was delighted to welcome the Right Rev Susan Brown, Moderator of the General Assembly, to the Scottish Parliament a few weeks ago. Each year the Moderator is invited to lunch with the Scottish Parliament’s Presiding Officer and a group of MSPs, before delivering Time for Reflection. Time for Reflection is a short contribution to open the week’s business in parliament and is one of the rare occasions where a non-MSP speaks in the chamber. The Moderator’s theme was a society which cares for all. During her speech she told MSPs that too many people in Scotland are ‘left to live on thin air’ and assured them that they would be in the prayers of many as they played their part in shaping a ‘new look UK’ over the coming months, regardless of the outcome of the Brexit process. The Guild The Guild meetings will recommence in October. pugnacity’. With regard to the Presbytery of Dumbarton, David was a natural for the post of Clerk which he undertook in 1986. His grasp of procedure at meetings was much appreciated by successive Moderators myself included. When my time came I was much in his debt for his whispered advice when things were becoming a bit intense, not to mention his polo mints which sustained me during the longer debates. But it was also his pastoral gifts which are remembered by members. I was at a Conference when I heard the news of David’s death and when I told a colleague who was also there, a former member of Presbytery; he shared with me a rough time he had endured when David was a major source of support to himself and his wife. Others knew something of that, times when a shadow had fell across your path, and David encouraged you forward. I once had a difficult task to perform for Presbytery. I had to go to a congregation on the Lord’s Day, tell them that their minister had been suspended from his duties, and then conduct worship. Mindful of how I might be feeling about that, David called me to the North Manse on the Friday for a chat. ‘Don’t try to be clever. Just go there and preach the Gospel.‘ That was a pastor’s heart speaking, not just for me but for the congregation involved. What they needed most in that moment was to hear the voice of the Good Shepherd. So many memories like that have been shared in the aftermath of David’s death on 21 January the day after he preached the Gospel for the last time at Gartocharn Parish Church. But those of us who heard the news very quickly began to think of those closest to him in the family he cherished. Joan, Catriona and Morag have the happiest memories of David as a husband, a father, grandfather and great-grandfather. They remember with thanksgiving his relationship with Jessie which realized the Biblical vision of two being one with Jessie being confidently pronounced by David ‘the perfect minister’s wife.‘ They remember happy family holidays, David’s interest in the things that were important to them, his encouragement in their studies, his hopes that they would fulfill their own personal dreams, his support throughout their adult lives and his joy when the family grew with grandchildren and great-grandchildren. It is to them that our hearts go out today. We hope they will continue to draw strength from one another but also that they will be encouraged by the faith in which David lived and died. That having fought the good fight and finished the race and kept the faith he now knows the fulfillment of all the Gospel promises in that place where no shadows fall and there is complete renewal in the presence of the Risen Lord. Amen. Flowers and crosses at Church entrance. Christian Aid Week is just a few weeks away. In the UK last year £8.5 million of vital funds were raised by 57,000 volunteers in 12,000 churches. This year’s Bridge Cross Challenge on Saturday 11th May will launch Christian Aid Week in Scotland. Christian Aid is delighted to welcome its Chief Executive, Amanda Mukwashi, to open the Erskine Bridge Cross Walk which will be celebrating its 32st anniversary. Over the years it has helped raise an amazing amount of money for Christian Aid. Last year our congregation contributed £1960. Do please join us again this year. You can walk and/or sponsor our Minister, who will also be taking part. Later this month sponsorship forms and information guides will be available on the Christian Aid notice-board next to the kitchen in the Assembly Area. Please take copies and also complete the Registration Form on the notice-board. Please ask if your sponsors are tax payers and will agree to Gift Aid. If they agree, then fill in their house number and post code on the sponsor form. This will enable Christian Aid to get 25p extra for every pound you collect. If you are not walking – please sponsor someone who is. If you don’t know who is walking, just look at the Registration Form on the notice-board. The Minister’s sponsorship forms will be in the Vestibule and Assembly Areas. 4th. 10th. 17th. 24th. 31st. Mrs. M. Sleight. Mrs. J. Hill. Anonymous. Ms. I. Mackinnon. Mrs. M. Waudby. Eighteen volunteers from our church helped at the Glasgow Winter Night Shelter for a week recently. Some did morning shifts, some evening, and some both. We all had different experiences, both poignant and funny, but possibly the team with the most exciting time was the one on duty on the Friday evening, Maureen Meldrum and Eleanor Wright, who found themselves present at a presentation of a cheque to the Shelter by Grégory Vignal, former player and current coach of Rangers Football Club. £30,000, half of the money, raised yet again by Rangers Charity Foundation sponsored sleep-outs at Ibrox, has once again enabled the Shelter to remain open to the end of March. Eleanor and Maureen with Grégory Vignal in the kitchen, with a more appetising array of eats than the usual toast. The rough sleepers arriving for the night enjoyed having the Rangers party present and a lot of photographs were taken. Social Functions Brew 'n' Blether - Save the date! The next Brew 'n' Blether will take place on Friday 3rd May, 2 p.m. - 3.30 p.m. Come and join us for tea/coffee, cake and time for a 'blether'. Entertainment to be announced later. An invitation is extended to anyone who is at home during the day. Bring a friend or friends; everyone will be made most welcome. If required, transport can be arranged - contact the Church office, 942 0507. We look forward to seeing you there! 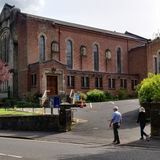 “Mind that Song” “Mind that song” is a service provided by Alzheimer Scotland, in conjunction with Bearsden Cross Church, which uses singing to bring people together in a friendly and stimulating social environment. Alzheimer Scotland- Action of Dementia is a company limited by guarantee, registered in Scotland 149069. Registered Office: 22Drumsheugh Gardens, Edinburgh EH3 7RN. It is recognised as a charity by the Office of the Scottish Charity Regulator, no. SC022315. 7.30 p.m. 10.30 a.m. 10.30 a.m. 10.30 a.m. 12.30 p.m. 7.30 p.m. 7.30 p.m. 2.00 p.m.
Easter Morning “Dawn” service with Communion 8.00 a.m.
10.30 a.m. 10.30 a.m. 7.30 p.m. 7.30 p.m. 7.30 p.m.
7.30 p.m. 2.00p.m. 10.30 a.m. 10.30 a.m. 10.30 a.m.